Eric Albretch (author from Technicopedia, aka Blakbird) published today an excellent review from the new 8263 (Snow Groomer) at Eurobricks. I loved the review contents, the details put on it and the style that we are already used to, from Eric's reviews at EB. I always feel they have also a very subtle sense of humor. I also felt this set as pleasant surprise, which revealed much better from what some of us may have thought, looking at the first box art images. It made me realize how wrong and unfair the opinions based on too early images, could be. Certainly one good reason for TLG trying to control and avoid any early image leaks. That said, I can only recommend you to read it and I take the excuse to skip reviewing this set, once I receive mine, as I believe to not have any relevant things to add. I should receive also my own 8258 (Crane Truck) late this month and 8265 (Front Loader) end of August. Most likely by that time, Eric already made his own reviews too, and hopefully as good as this one. Realized meanwhile from a David's comment, who contributed with the 8258 inventory to Peeron, that this truck will come with a new version of the '62.4 x 20' wheel. Basically if features a shorter axlehole, in comparation to the previous wheel design. 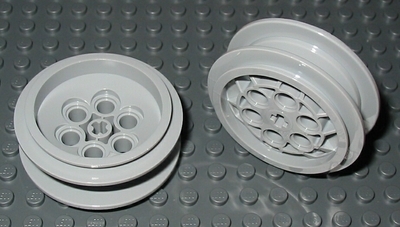 Also it looks like the new version uses a '+' hole, to compensate the friction decrease by shortening the axlehole, instead of the 'x' hole of the former version (too use the BrickLink characteristic naming convention). The older version on the left image, and the newer one on the right. thanks for providing us with the inventory data. Nice work. I fact, I didn't realize on the new wheel type. Good point. Will try to update the post next. Another thing that drew my attention in Eric review is that the instruction manual for the B-model is provided in the box. It looks like LEGO has reacted to the many complaints about the manuals only being available for download and not in print! Next up plastic wrapping to avoid dog ears..? The groomer is very quality built! The inventory just makes this more of a must-have model. Not only two excellent models in their own right, but lots of parts that are too rare or expensive to justify their purchase on Bricklink. In fact I agreed its removal is a small step, but still a step towards a more environment friendly awareness. Box plastic wrapping to avoid the dog ears!?? Nahhh! Then forget about sustaining our environment footprint growth. Not the box, the instruction manuals. Totally agree. One paper envelope should be enough.